Thanks in part to the widespread recognition of its healthful, aesthetic, and palate-pleasing qualities, Japanese cuisine has in recent years become a truly GLOBAL PHENMENON. And though now the world over, through encounters at restaurants or through one or more of the many books or articles being printed about Japanese food, the general public has become familiar with the likes of sushi,tempura, sukiyaki, or shabushabu, very few non-Japanese, even those who consider themselves great fans of Japanese fare, have ever heard of , let alone tasted, what is probably the most typical Japanese food, especially of autumn- SANMA, a silver, knife-shaped fish which is usually eaten grilled whole, and served with grated radish, soy sauce and lime (kabosu). In fact, while researching this article, I went through all the English language books on Japanese cooking and culinary culture I could find at Tsukuba`s libraries and bookstores, and was amazed to find no references at all to grilled sanma. I attributed this to the fact that this fish, called saury, or pike mackerel in English, is not readilly available at most supermarkets or fish store outside of East-Asia. That might explain why this most common Japanese fish dish would be omitted from cook books designed to be sold in Wesetrn countries. If the readers couldnt buy sanma, I guess including the recipe for it would just be a waste of space. This does not explain, however, why there would be no mention of sanma in a very detailed book (put out by Lonely Planet) on how to order Japanese food while visiting Japan! The only thing I could think of that could explain this oversight would be that editors considered grilled sanma HOME COOKING. If this was their reasoning for failing to include sanma in their book, they surely have made a major error. Because not only is grilled sanma a staple of TEISHIKU (set lunch) joints which cater to university students, but it is also a typical fish to be ordered grilled at IZAKAYA- Japanese style pubs which also serve up traditional dishes. So here, for the english speaking ( or should I say READING) world, I would like to put grilled SANMA in its proper place as one of Japan`s great foods, -healthy, delicious, and beautifully served. 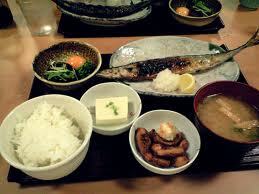 A representative taste of autumn, which by the way, makes for one of Japan`s most reasonably priced meals. In Japan there is an old saying SANMA GA DERU TO ANMA GA HIKKOMU (秋刀魚がでると　あんまが引っ込む), the equivalent of the American expression-An apple a day keeps the doctor away ( though literally it means- when sanma comes out, the masseuse stays in! ), which is a testiment to the nutritional value which the Japaneses have long attributed to this fish. It came as no surprise then today,that when I mentioned sanma to my friend Yoshida-Sensei ( a man in his 80`s), the first thing he said was- Ah! Its good for the eyes! But even more than being highly valued for it health giving properties, sanma is enjoyed for its taste, which as I have already mentioned above is one of the representative tastes of autumn. The word SANMA is in fact a haiku KIGO (seasonal keyword) for autumn ( the characters now used to write the name of this fish- 秋刀魚- literally mean autumn knife (shaped) fish). Why autumn? Well, it is in that season, when large schools of these fish have arrived off the coast of Northeastern Japan after having swum down from the cold waters of far northern seas, that they have been traditionally caught, using light to easilly attract them to fishing boats at night ( in former ages it was the bright autumn moon which attracted the fish to the surface). At this time the fish still have plenty of oily ( and tasty and nutritious) body fat. It is this fatty layer which makes them so tasty, and also makes it necessary to grill them them, as opposed to being eaten raw as sashimi. Sanma fresh off the grill at my house in Tsukuba- makes my mouth water looking at it! Interestingly, in the days before fresh fish could be quickly transported to anywhere in Japan, it was said that in Kanto sanma was delicious, while in Kansai ( western Japan- including osaka, etc.) sanma was not. The reason for this was that while the fish caught of the coast of what is now Chiba Prefecture or Ibaraki still had plenty of fat on them, by the time they made it near the shore of Wakayama, etc. in western Japan, they had swum all that succulent oil right off. 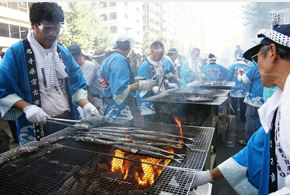 An important consequence of being so fatty, is that when sanma are grilled they create a lot of smoke. 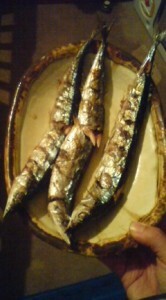 Traditionally housewives would grill sanma outside in the yard on round grills called SHICHIRIN. 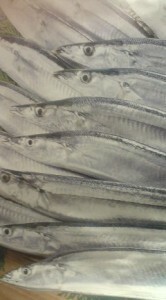 These days, most sanma are grilled indoors in the broiler which can be found in just about any Japanese kitchen. Even ventillators turned up to full blast cannot stop the whole house from getting filled up with smoke. Frequent grilling of smokey sanma is probably the reason that the very fire safety conscious Japanese usually do not have smoke detectors in their homes (like most westerners do). If they did have them, they would go off every time sanma was cooked! One day, while the third Tokugawa Shogun, Iemitsu, was out hunting with his falcons, he was overcome with hunger. Stopping at a tea house in an area called Meguro (now in central Tokyo) and asking for something to eat, the shogun was served grilled sanma, a lowly dish which he would never under any circumstances be served at the castle. As you might have guessed, Iemitsu his rustic lunch. In fact, back at Edo Castle, when asked by the master chef what he would like for dinner, the Lord replied- sanma. After having confirmed that sanma was what the shogun really wanted, the chef ordered some brought in. The chef then proceeded to skillfully fillet it and then steam it up, removing all the unseemly fat. When dinner was served the shogun`s mouth was watering in anticipation. But when he put the fat-free, skinless, bone-less, gut-less fishmeat to his tongue and started to chew, his heart sank in disappointment. All he could say was- when it comes to sanma, Meguro is the place. The restaurant at which the story took place still exists today. And though Ive never eaten there, sanma has still become one of my favorite foods in Japan, having grown accustomed to it at the cheap set lunch joints around Tsukuba University. 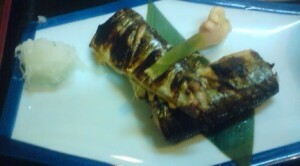 One grilled sanma with a dab of grated radish on the side. A big bowl of Ibaraki rice. A small square of tofu. A little dish of pickles, A bowl of miso soup. All the tea you can drink. From anywhere between 6oo and 900 Yen. If you have the chance, why dont you give it try! There are many ways to prepare sanma, but any Japanese will tell you that grilling, despite all the fishy smoke, is THE best way to enjoy it. Who cares if it`s common ! Sanma deserves a place in the internationally recognized pantheon of great Japanese foods! Maybe Your Bicycle WASN`T Stolen- it might merely have been RELOCATED nearby by Tsukuba`s INDEFATIGUABLE early morning BIKE-MOVERS! In my childhood days in Gunma Prefecture I remember my mother cooking samma outside the house. I could smell the smoke and feel happy.I thought We are eating samma for dinner. Cooking outside with the other mothers was a good chance for taking communication in those days.And for we children it was always a delicious dinner.Cooking in the house now is quite a different type of atmosphere as we are closed of from our neighbors. The samma is still good anyway.